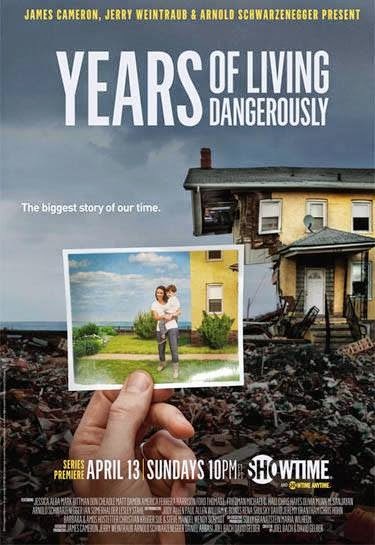 Showtime premieres its nine-part documentary series Years of Living Dangerously tonight at 10 p.m. U.S. EDT. The series uses some of the biggest names in Hollywood to draw attention to the impacts of climate change. James Cameron, Jerry Weintraub and Arnold Schwarzenegger are on the team of executive producers, while celebrities noted for their environmental advocacy appear on camera including Don Cheadle, Harrison Ford, Matt Damon, Ian Somerhalder and Jessica Alba. The goal of Years of Living Dangerously is to galvanize a national conversation on the realities of climate change and inspire people to share their own stories and empower them to get involved in solutions. I watched the first episode, available early and for free on YouTube, and understand why the reviews are extremely positive. It is a beautiful piece from a filmmaking standpoint, but then of course these folks aren’t awards darlings for nothing. During the first hour, viewers follow Ford, Cheadle and New York Times columnist Thomas Friedman to three countries filled with stark shots of droughts, job loss, burnt forests and civil war. The creators’ meaning is clear: climate change is real and wreaking havoc in myriad ways across the world. Climate scientist and Evangelical Christian Katharine Hayhoe provided the only thing close to a call to action in the episode, saying we need “policies in place to actually start curbing our carbon emissions.” At that point I thought, “Here comes nuclear.” Yet there was no mention of policies favoring nuclear, or any energy policy solutions for that matter. I didn’t really expect solutions to be presented at length during the first episode. Hints would have been nice though. I found myself repeatedly wondering if the series would offer realistic policy solutions and, more importantly, if these stories were compelling in a way that moves governments toward those solutions. Because that is the scale we are talking about here. Sure, average viewers can do their part, embracing energy efficiency and sharing their stories. But what does the series propose for curbing emissions on a global scale while still meeting energy demand for a growing population? That remains to be seen. Ted Nordhaus and Michael Shellenberger of The Breakthrough Institute recently shared their concern in a New York Times op-ed that the series’ approach will not result in meaningful change, and that “turning down the rhetoric and embracing solutions like nuclear energy” would have been more effective. I want to reserve judgment until I’ve seen the remaining episodes, though their initial concern does seem warranted. The series’ website hints that they will call for a halt to burning fossil fuels and a ramp up of renewables, while nuclear energy gets no mention. Even before Pandora’s Promise was made, I’d become convinced that nuclear energy should be part of the climate change solution. Once I saw Pandora’s Promise, I knew the film would get people thinking about nuclear in a whole new way. I like that the film lays out the facts and then viewers can make up their own minds about nuclear power based on the facts and information presented. Documentaries like this open people’s minds and lead to informed decision-making, which is critical if we want to tackle the world’s biggest challenges. 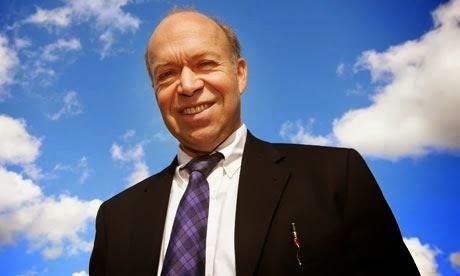 Science advisor James Hansen, formerly NASA’s chief climate scientist, came out in favor of nuclear energy last year and has been grabbing headlines since. Last March, he published a paper demonstrating that nuclear saved 1.8 million lives by replacing fossil fuels. In November, he joined three other noted climate scientists in issuing an open letter that urged environmentalists and politicians to support nuclear energy as a primary way to reduce carbon emissions. Hopefully the involvement of Allen and Hansen means that the Years team will acknowledge nuclear energy’s key role in curbing carbon emissions. Because as compelling as the stories of cause and effect are, the story of nuclear’s clean air benefits as part of the solution can compel policymakers to take realistic actions. Clean-air electricity sources—nuclear, hydropower, geothermal, wind and solar—are important to America’s diverse energy mix, because they do not produce greenhouse gases. Nuclear energy is the largest of these sources generating 64 percent of America’s clean air electricity. A nuclear power plant’s byproduct consists of used uranium fuel rods safely stored in pools or concrete containers rather than CO2 or air pollution associated with acid rain or urban smog. By using nuclear energy to produce electricity, America prevents the emission of 570 million metric tons of CO2 per year. That’s the same as preventing the emissions produced by 110 million cars—the vast majority of U.S. cars on the road today. Mainstream analyses conducted by independent organizations have shown that reducing carbon emissions will require a diverse energy portfolio and that nuclear energy is the only low-carbon option to help meet forecasted global electricity demand. Unless people like Hansen and Stone had editorial control, this series will have the typical feel-good "soft energy" talk that caters to the innumerate. Hansen's Congressional testimony about low-carbon success stories had no mention of Denmark or Germany; he cited nuclear/hydro Sweden. Also, Tara, I don't think you give nuclear enough credit for cutting US carbon emissions. In 2011, nuclear energy delivered just under half (45.6%) as much power to the grid as coal. In the same year, the electric power sector emitted 1.718 billion tons of CO2 from coal. Had the nuclear-generated electricity been replaced by coal, the extra emissions would have come to 783 million tons, not a mere 570.